Can Samsung and Android combine to best the iPod touch? An abject failure. A potentially good player is hidden behind some of the worst software issues we've ever seen. With the Samsung Galaxy Player 50, we seem to finally be seeing a household name come out with major competition to the iPod touch. Now that the Galaxy brand is strong, the time seems right for this Android media player. Samsung's plan seems simple enough: forget the over-engineering and compete on extra features and price. It's a familiar Android tune, and one that's worked pretty damn well in the smartphone market. What we have is a touchscreen PMP with Android 2.1, Wi-Fi, micro-USB connectivity, a two-megapixel camera and a built-in microphone. It beats the iPod touch in a couple of key areas, with a built-in GPS chip, removable battery, FM radio and a microSD card slot for adding up to 32GB of additional memory. There's already 8GB of on-board memory, so all that looks pretty good for £149 – £40 less than the 8GB iPod Touch. There's also a 16GB version for £179. All of that sounds enticing, but there are a few caveats. The 3.2-inch screen is slightly smaller than the iPod's 3.5 inches, which isn't that big a deal in itself, but the resolution is only 240 x 400 pixels. While we weren't expecting Samsung to match the glorious 480 x 960 of Apple's Retina display, we were hoping for something more like the 480 x 800 four-inch screen on the Samsung Galaxy S, Samsung Omnia 7 or Google Nexus S.
One other thing those handsets have in common? They're all AMOLED. This isn't. The screen on the Galaxy Player really looks low-res, too. It's pixelated and text can appear unclear. The other advantages the iPod has is its front-facing camera and the ability to record video in HD. Spec for spec, are these worth the £30 more that Apple's charging? We'd say yes, primarily for the Retina display, but the microSD expansion and GPS chip mean we'd probably call it even on value for money based purely on the specs. 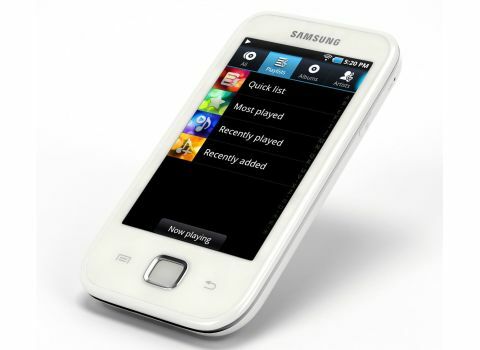 The Galaxy Player is plastic, and feels light and a little cheap. However, that's not to say it's low quality. It's feels solid in the hand, and the lightly bumped battery cover adds some grip to it. At 54 x 11 x 105.5mm, it's a fair bit thicker than the iPod Touch, but is smaller in the other two dimensions. At just 84g, the Galaxy Player trounces the iPod when it comes to weight, with the latter coming in 101g. On the front of the player, underneath the multi-touch screen, are three buttons: Menu, Home and Back. The Home is a physical button, while the others are touch sensitive. On the device's right side is a lock/on/off key and the microphone, while volume controls are on the left. On the top is the 3.5mm headphone socket and the micro-USB port, which has a little slide-over cover that actually feels pretty solid and reliable. The removable battery is 1000mAh, which is much smaller than what you'd get on a smartphone. This isn't so much of a problem as there's no cellular radio constantly going here (unless you let the GPS run all the time), so battery life is actually pretty acceptable. Not really any better than its competitors, but not bad by any means.